Melbourne Removals | Melbourne Furniture Removalists | Save time save money: Our little trucks can get really close. Book 'two little (2 Tonne) trucks and two men' from $110 per hour. * Trucks get close to door. Save time and money. Buy better things instead. Moving interstate? Backload Price automatically quoted when available for your preferred pickup date, as well as a 'whole truck to yourself' price. Daily service interstate in Melbourne at low rates! Choose Melbourne Removals for fantastic service at unbeatable rates! Call today! and Furniture removals from and to all places in between. Furniture Removal Quotes and Bookings -Booking a Furniture Removalist Couldn't Be Easier! Calling furniture removalists for quotes can be a time consuming and frustrating experience. With some furniture removalists you call or email, you spend a lot of time going through your inventory and details and after hours of waiting you finally realise that they don't even call back with your quote! We offer the convenience of instant on-line quotes and bookings for furniture removals from and to almost anywhere in Australia. With our on-line quote system you will get a fixed price as well as an hourly rate or backload price where applicable within minutes. From there you can book your furniture removal, add or delete items and revise your quote or booking instantly - no more wasting time on the phone or email for furniture removalists that may never call you back. For a more details about our moving services please see our additional furniture removal services page. We can come to you and load everything directly into storage containers with plenty of furniture felt packing, where your belongings can then stay until you are ready for delivery back out again. No double handling required*. Ideal for when you are renovating. Storage and redelivery prices are included with our quote. (*Please note minumim charge for a direct full container pickup is $220 each way. Furniture Removal Container Loading and Unloading: Melbourne and Brisbane. For a price, please click ' Continue ' here. Then enter a job 'from Melbourne to Melbourne', together with the Cubic Metres (in the 'Van Size as selected' field), total floors and lifts to Load or Unload plus the total driving distance (round trip rail to rail) for all jobs in the container in the sections provided. A fixed Price will be emailed in a matter of minutes. 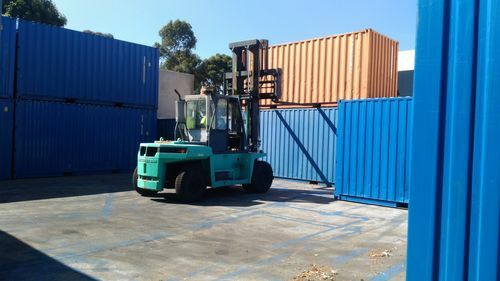 We can usually store your container for limited time and we may be able to send it back re-loaded with either your jobs or ours. Book Your Removalists On Mobile. Book by Mobile all online. With Melbourne Removals and Transport Pty Ltd, you can get instant quotes and bookings for your furniture removal. Booking a removalist has never been so easy!